Following on from the success of Kau Tapen, the owners opened Villa Maria in 1994. It is situated on Estancia Jose Menendez, one of the biggest and oldest working estancias. Just six rods fish the lower Rio Grande from Villa Maria and the small lodge size makes it ideal for a small private party. The small lodge size and homely atmosphere at Villa Maria make for a very enjoyable and informal lodge experience. The water is ideally suited to double-handed rods and features many of the traditional cut-bank pools that the Rio Grande is known for. Fishing the lower pools of the river, fresh fish must pass through and frequently stop in the excellent holding water. The waters of the Rio Grande can look silky smooth and give the false impression of slow moving water. There is, in fact, an excellent flow through the river but wading is very easy with pea-sized gravel throughout. Villa Maria has a riverside cabin where rods have lunch and rest during the afternoon siesta period reducing driving times to a minimum. As part of the Nervous Waters stable of lodges, high standards of food and accommodation are delivered at Villa Maria. 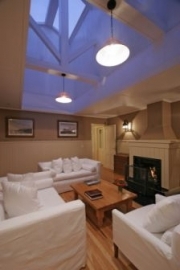 The lodge consists of four comfortable bedrooms and three bathrooms. There is a cosy living room with a fireplace and separate dining room. Local meat is frequently on the menu and once a week there will be a traditional asado. This is often the culinary highlight for visiting fishermen. Great for a private party. Land packages are from $5,950-$10,580 for a 7-night stay depending on the week.